The barber has a real antique barber chair from 1905. 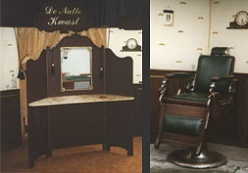 We provide a nostalgic backdrop and guidance of an eloquent barber. 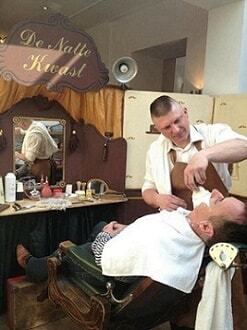 The barber lures non hoarse one in his tent and lets hem loose again only if it is so slippery as an eel. A beautiful ritual! First, shampooing, shaving then, if necessary touch with alum stone and finally massaging the cheeks. The barber has a chat about any and is aware of the latest gossip. Your guests will be satisfied when they leave the 'hairdresser'.